I seem to be finally getting back into the swing of things. My room isn’t sorted out yet by a long way but at least there is space to work, so in between the bouts of tidying up, I can make the odd book or two. I have been kindly mentioned in a couple of exceedingly long awards and link love New Years greetings over the last few weeks. The number of people mentioned in these lists is vast (over 300 links) and seems to be pretty much the same bunch of people so I am not going to repeat each list over and over again. I just hope that saying it once covers everyone -if not apologies, please go to the relevant links and check the original lists! First Jon at El Gigante Verdoso passed the You Rock my Socks’ award to Jos over at NoDirectOn (not: NoDirection) (I think that’s right) (who has a very cool scrolling box to display his list) (and that’s far too many parentheses (brackets to you) for one sentence). 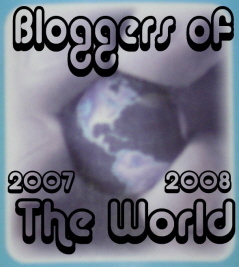 Next Mauro, over at 1 Million Love Messages awarded the 2007 Inspiring blogs award . and not only had a very neat scrolling box to display his list but repeated it for folk like me who can’t do scrolling boxes – over 300 links. 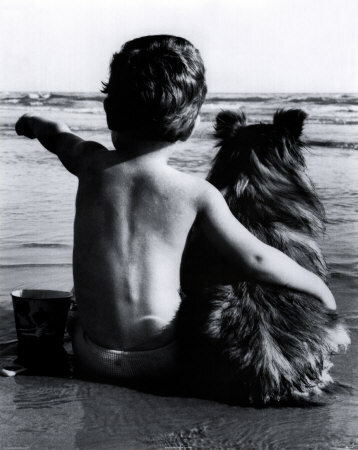 Then Blue Ribbon Bloggers had a Blogging Buddies award, which is this rather sweet photograph. Again they had a groovy scrolling box containing pretty much the same list, which I am very jealous I can’t reproduce. Anyway, if you have lasted this far, here comes the list, courtesy of Colin. Phew! Job done. Just hope all those links work! If you made it this far then here is a photograph my number two son took as an experiment. It’s me in my kitchen – my mum used to say I was a little angel…. Just a little post lol…links are fine, well done. My little list has spread far and wide hahaha…..I’m just bad lol. Very nice book. It looks crafty but also very professional. Does all this link love come from FMB – where I first came across you? Your pages are always blank. Colin! So sorry I just found you in my spam! All credit to you for your hard work! And as we know, you are the award king – and rightly so. You will need to start a separate blog for yours soon! Hi Diane, Congrats on your awards. I need to ask though. Could you remove my name from your list of names there. Congrats! 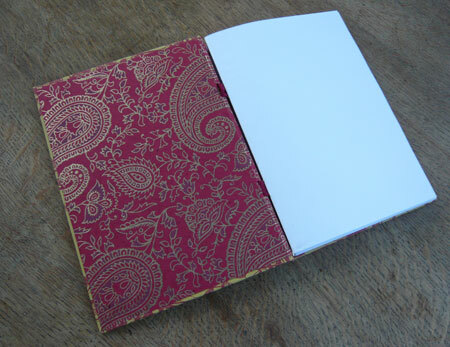 Again, another beautiful journal… So jealous. 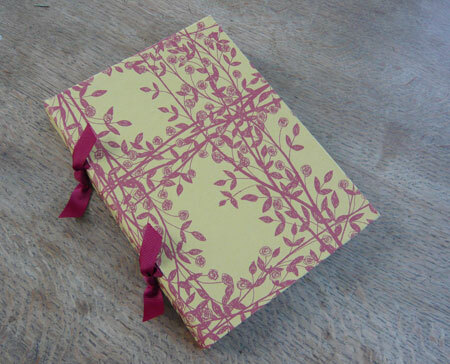 I need to start practicing book binding..
Kim – glad you like this one it is an unusual colour combination for sure. As for link list – you have Colin to thank for it – use by all means! I couldn’t do the scrolling box thing but I expect you can! Oh dear! 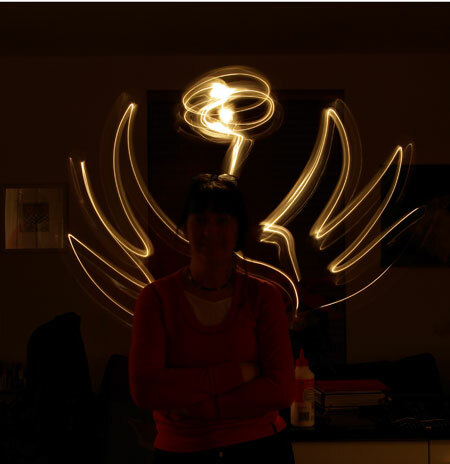 SU is normally very good – it’s Technorati I have serious issues with! Hope your shoulder is getting better. Rose des Rochers – Thanks! I have removed your name – and renumbered the entries after you. Thank goodness you were towards the end! I visited your blog and enjoyed reading it. I shall drop in again! Ohlala! Bridget has done it again right? Slid down fireman’s poles! Sorry Di. Your work is really beautiful– I marvel at it, every time I stop by. There are so many people out there making hand made goods that look like they came from “somebody’s garage;” yours looks like true art. That is a really nice thing to say and I must admit, it’s what I strive for. 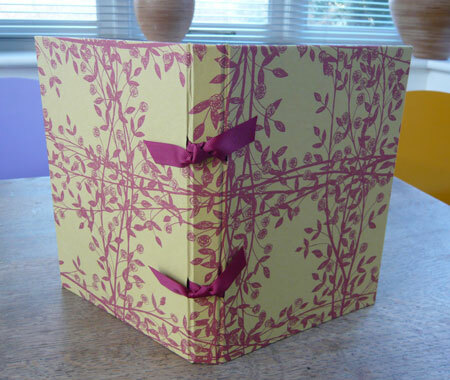 I try to put as much thought into the colours and combinations of pattern and colour as I do into the process of making the books, so if you think I have succeeded then I am well pleased. Thank you! My pleasure, Bobby. I think a list this long has to be a one-off! Glad you are included! Hi Diane! How are you? Great blog here…beautiful. I love your albums. I’ve given you some linklove as well. Congrats on your awards! Thanks for the link love too….